The technology behind something that is a staple of any outdoor event, blowing bubbles has improved in many ways over the years. Gone are the days where you needed to stick a wand into a bottle of bubble solution and physically blow into the wand to create bubbles. These days, we have bubble machines and now things have gone handheld with bubble guns. Bubble guns combined stand alone bubble machines with bubble wands of old, making the experience of blowing bubbles much less of a chore and something that is indisputably and decisively enjoyable. Read on to discover the best four of these contraptions and what makes them do what they do. Ordering bubble solution or going to the store for bubble solution can be a troublesome undertaking whether you are using a bubble machine or bubble guns. Fortunately, Joyin Toy comes with 6 bottles of bubble solution, 2 for each of their bubble guns. Batteries are also included, which is very nice. No child will feel left out with this set either, as it contains three bubble guns. They all light up with LEDs at the top, which makes things even more enjoyable. This also makes it possible to play with these bubble guns in the dark. The way Joyin Toy’s bubble guns are set up is pretty questionable. You attach the bottle of solution across from the trigger, as it dangles precariously from where it is attached to. It looks like it could fall off at any moment. Expect bubble solution to drip from the bottle of solution. While this is an industry standard for bubble guns, this still could have been designed much better. Joyin Toy’s bubble guns are made of plastic, thus they are not too durable, especially with all the small mechanical parts inside. One massive drop could destroy the gun forever. Most bubble guns are designed so that the solution is across from the trigger. This is understandably precarious for many who wish to buy these bubble guns for their children, but it cannot be helped. Fortunately, Haktoys has upgraded this design to lock the bubble solution in a lot tighter than with other bubble guns, ensuring that the solution bottle does not fall out. It also prevents solution leaks. Other bubble gun manufacturers should learn from this. Haktoys’ bubble gun also comes with batteries and two solution bottles, which eliminates any need for preparation. The gun comes with all that is needed to begin using right away. The barrel of Haktoys’ gun requires some attention after every use. If it is not cleaned after every session, it will clog up. Keep this in mind. Only one bubble gun comes with Haktoys’ set, so prepare to buy more than one if that is necessary. This is unfortunate, since there do exist some bubble gun sets that have multiple guns. There are LEDs on the top of Haktoys gun, but they are not as bright as they should be. There are definitely brighter LEDs on other bubble guns. Most bubble guns can create a good amount of bubbles, but they either leave you wanting more or the solution runs out. In either case, being unsatisfied will happen. That’s where Rainbow Bubbles’ gun comes in. The end of this bubble gun is much bigger than most others, and it can create thousands of bubbles very easily. The bubble solution screws into the end of the shaft of the gun like with other bubble guns, but it can also function as a pistol grip of sorts. When the solution is screwed in, it is screwed in that tightly. No leaks will occur and the bottle of solution will not come off at all. Batteries are not included with Rainbow Bubbles’ gun. It also uses three batteries while most other bubble guns use only two. If Rainbow Bubbles decided to include batteries, it would be much better. Only one bubble gun comes in Rainbow Bubbles’ set. If more than one gun came with the set, it would be that much closer to being the premium bubble gun to own. There are two things that you will never need to worry about when it comes to Prextex’s set of bubble guns. The first, obviously, is having enough bubble guns available so that everybody can have a good time. There are five in this pack, which is more than many bubble gun packs. Batteries is the other thing that you will never need to worry about. Prextex’s bubble guns do not need batteries to operate. One bottle of bubble solution for each gun comes with the package, so there is no need to worry about going out and buying bubble solution or ordering any bubble solution. Nothing can be perfect, however. Prextex’s guns are small, very small. Compared to other bubble guns, they will not create a lot of bubbles. This is expected for a five pack such as this. These bubble guns are also very, very delicate. Things will not end well if they are dropped. Unlike the bubble guns that are battery operated, Prextex’s guns are made completely of plastic. Combine that with their compromisable size, and they will not survive a drop. 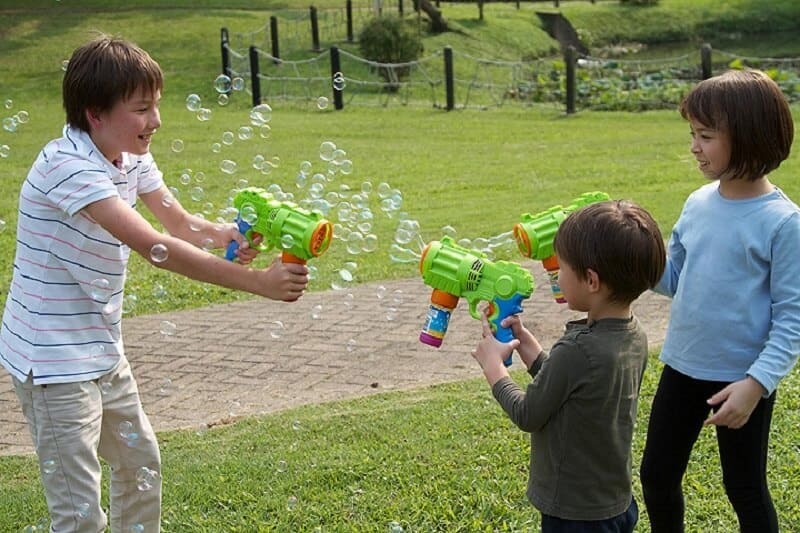 Think of a bubble gun as a cross between the original wand that you had to blow through to create bubbles and the advanced bubble machine that can create thousands of bubbles per second. Combine this with a watergun, and that is essentially what a bubble gun is. Some bubble guns can operate without batteries. Like waterguns, these are made completely of plastic. They will not create a lot of bubbles, but they are convenient for when you do not have time to prepare for a gathering that would be made better with bubble guns. The ones that do operate on batteries vary in terms of how many bubbles they create. In this case, bigger is better and more is more. A bubble gun that uses three batteries will decisively create more bubbles than a gun that only uses two batteries. How long do the batteries last? They should last more than a few sessions. The solution that comes with most bubble guns typically do not last long enough to drain the batteries. In most cases, the bubble solution will run out before the batteries do. In all cases, the bubble solution needs to be attached to the base of the gun. This is because the mechanics on the inside of the gun need to take the solution from a place to process the solution and propel this down the shaft of the gun. This is why bubble guns need to be handled with great care. Nearly all of them have plastic exteriors, and if one part of the interior is damaged, the bubble gun itself will likely stop working. Bubble solution can build up at the barrel of the bubble gun. If it is ignored, it will solidify, clog up the barrel, and it will be impossible for solution to get processed into bubbles. To prevent this, be sure to clean off the barrel of any bubble gun after using it. Can you use any form of bubble solution in a bubble gun? Unfortunately, the answer is no. This is because the bubble solution has to be attached to the base of the gun. This means you need to get bubble solution bottles that are specific to bubble guns. Usually the bubble gun that you ordered will come with its own bubble solution bottles. You should be able to buy refills of these bottles from the same manufacturers or company that you bought the bubble gun from. http://www.heavybubbles.com/ is a participant in the Amazon Services LLC Associates Program, an affiliate advertising program designed to provide a means for sites to earn advertising fees by advertising and linking to Amazon.com. Amazon, the Amazon logo, Amazon Supply, and the Amazon Supply logo are trademarks of Amazon.com, Inc. or its affiliates | Buzmag By Buzthemes.